Most Spanish companies with Internet access were aware of the importance of having a security mechanism to protect their data, the internal or external transactions made via Internet and to avoid unauthorised accesses to their systems. 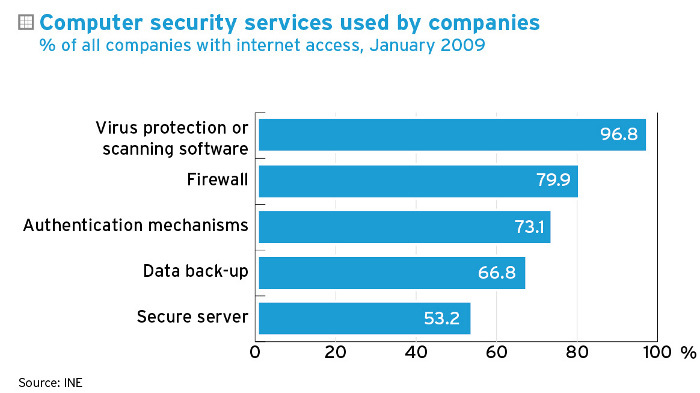 96.8% of Spanish companies with Internet access and 10 or more employees used virus protection or scanning software. This was the security mechanism most used by said companies. It was followed by firewalls, used by 79.9% of companies with Internet access, authentication mechanisms (used by 73.1 %) and data back-ups (used by 66,8 %). In the last place were secure servers, with over half of the companies with Internet access using them. Percentage of companies using logic security mechanisms to protect their data and the transactions made in their systems. Postal survey on the development of the Information Society in Spanish companies, of a sample of 32,950 companies: 19,436 companies with 10 or more employees and 13,514 companies with less than 10 employees.